Of fighting ships and their persuasive power. 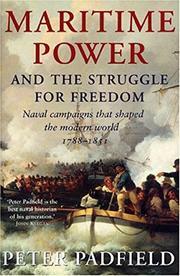 The title of British naval historian Padfield’s latest, companion to his 2001 study, Maritime Supremacy and the Opening of the Western Mind, promises wide-ranging inquiry. In fact, this volume is of considerably narrower scope, focusing closely on the Royal Navy during the Napoleonic Wars, with some attention given to the later period between Waterloo and the rise of the transatlantic steamer trade. Though England’s loss of its southern American colonies weakened it militarily, Padfield writes, victory against France at the 1782 Battle of the Saints “reestablished British naval ascendancy in the vital struggle against the Bourbons; even more significantly, although financially much exhausted, Britain ended the [colonial] war in far better shape than France or Spain.” That ascendancy was instrumental in containing and eventually defeating Napoleon, who inherited some of Louis XVI’s view that France’s future would be built on the high seas but then devoted himself largely to dry-land conquests. Before contending with Napoleon full on, however, the Admiralty had to grapple with the financial problems of building and funding a modern navy, as well as with the occasional outbreak of mutiny (even if that of the Channel Fleet in 1797 was “conducted with exemplary restraint and respect.” The author covers all these things well. He is particularly strong on naval tactics, as we see in his analysis of Admiral Duncan’s conduct at Camperdown and Lord Nelson’s at Trafalgar, “not the culminating achievement of the sailing era, but an anomaly induced by their enemy’s decline. They were tactics of disdain.” Disdain, of course, that won the world, if only for a few generations. Somewhat less accessible than Herman Arthur’s recent To Rule the Waves (p. 848), but a narrative of interest to fans of Aubrey, Hornblower, and other heroes of the tall masts, as well as of naval history.